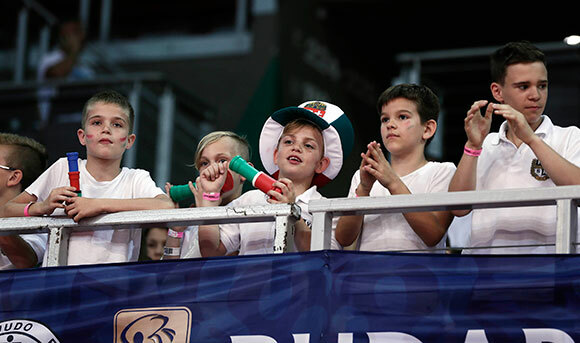 The Budapest Grand Prix 2016, the final Grand Prix in Europe before the Rio 2016 Olympic Games, opened on Saturday with 130 judoka (75 men, 55 women) fighting on day one at the Papp László Sportaréna. The Hungarian Judo Association’s premier event – which will make way next year for the country to hold the 2017 IJF World Judo Championships which will have a record total prize money of $1,000,000 – was dominated by Japan and Slovenia who finished day one first and second in the medal table respectively with Kosovo in third place. Ahead of the final block, the opening ceremony took place as Dr. László TÓTH, Hungarian Judo Association President, made the opening address. IJF President Mr. Marius VIZER made the first address on behalf of the International Judo Federation. IJF President Mr. Marius VIZER then presented IJF Grand Prix gold medals to Mrs. Nadia COMANECI, Romania’s five-time Olympic gymnastics champion and to Mr. Ilie NASTASE, IJF Ambassador and former tennis world number one. Dr. TÓTH László then presented IJF Grand Prix gold medals to IJF President Mr. Marius VIZER, Mr. YAMASHITA Yasuhiro, IJF Development Director and IJF Hall of Famer and Mr. UEMURA Haruki, IJF World Promotion Director, Kodokan President and Hall of Famer. On Sunday the heavyweights will collide as stars such as Olympic champion Kayla HARRISON (USA) and world champion YU Song (CHN) will make their final appearance on the IJF World Judo Tour before the Rio 2016 Olympic Games in just eight weeks’ time. 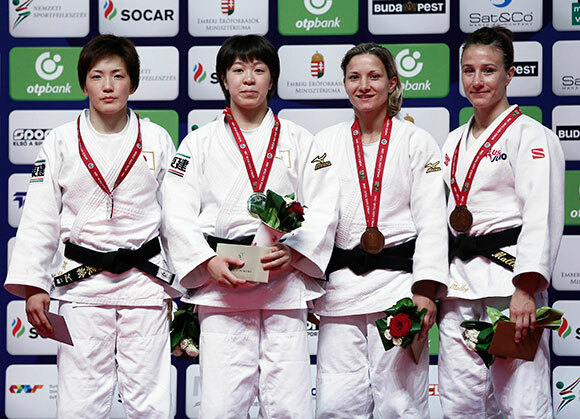 Former World Judo Masters winner ENDO Hiromi (JPN) signalled her return to the elite level by winning the first gold medal at stake on day one of the Budapest Grand Prix. ENDO, 23, won the Cadet World Championships in Budapest in 2009, before going on to experiencing senior success including a stunning World Judo Masters win in 2013. The Japanese fighter’s career has stalled since then due to a run of injuries but ENDO is back and has already put her name into contention for a long battle for a place at the Tokyo 2020 Olympic Games. ENDO met 18-year-old IJF World Judo Tour debutant Romane YVIN (FRA) in the first final in Hungary and controlled the contest from start to finish as the Budapest specialist held down the young Frenchwoman for 20 seconds for ippon to open Japan’s medal account in fine fashion. The first bronze medal fight pitted Cluj Napoca European Open bronze medallist Violeta DUMITRU (ROU) against Rio-bound Taciana LIMA-BALDE (GBS). The world-class African fighter produced an assured display as she fought past her Romanian foe by scoring a waza-ari with a deft piece of footwork before adding a yuko from osaekomi. Lisbon-based LIMA-BALDE will be confident of challenging for honours at her first Olympics as she becomes the first Guinea Bissau judoka to compete at the Olympics in Rio. 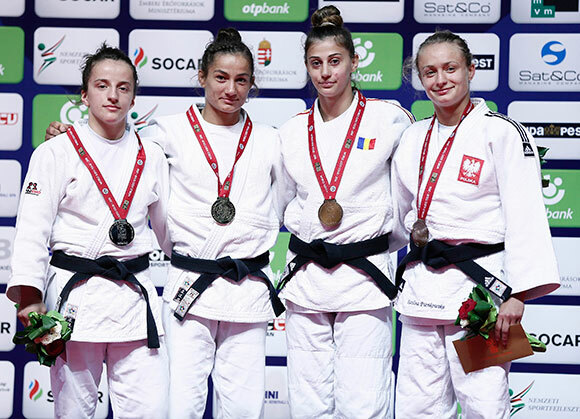 The second bronze medal fight opposed Sofia European Open silver medallist Milica NIKOLIC (SRB) and 19-year-old former Junior European champion PUPP Reka (HUN). NIKOLIC was the stronger of the two judoka as she scored a yuko and a waza-ari while youngster PUPP who was willed on by the home faithful mustered an ambitious uchi-mata attempt as she was second best but is a hope for the future for the hosts. Two-time world champion Majlinda KELMENDI (KOS) faced her lead training partner and understudy in 20-year-old Junior world champion Distria KRASNIQI (KOS) in the -52kg final on Saturday. The two Kosovo stars walked to the venue together ahead of fighting each other and went all out in a gripping bout. Club and international team colleagues KELMENDI and KRASNIQI, who live on the same street, were unable to score as KELMENDI prevailed on shido penalties 1:3 and the pair shared a special moment on the mat as they showed their mutual respect and friendship knowing that neither of them would be where they are today – on the Budapest Grand Prix podium among other triumphs - without each other. The first bronze medal contest was won by former Junior World Championships silver medallist Larisa FLORIAN (ROU) who lifted former Astana Grand Prix silver medallist Christianne LEGENTIL (MRI) with a huge ura-nage for ippon after just 42 seconds having led by a waza-ari. LEGENTIL has been training and living at the IJF centre in Dunavarsany to prepare for the Games having finished seventh at London 2012 and will quickly put her Budapest disappointment behind her to target the top ranks in Rio de Janeiro as she did in London. In the second bronze medal fight world number 38 Karolina PIENKOWSKA (POL) narrowly defeated Junior European champion Astride GNETO (FRA). PIENKOWSKA pipped GNETO to the podium with a low tai-otoshi scoring a yuko and the 20-year-old French fighter, whose older sister Priscilla will represent France at the same weight at the Rio 2016 Olympic Games, fought to the end of the four minutes but her opponent held on with three shido penalties against her name. Former world champion UDAKA Nae (JPN) was humbled by former Junior world champion and former Asian Championships winner TAMAOKI Momo (JPN) in the Budapest Grand Prix -57kg final on Saturday. The -57kg category is arguably Japan’s strongest and it was TAMAOKI, 21, who won bronze in Budapest a year ago, who took the contest to her more accomplished opponent. Neither judoka was able to penetrate the scoreboard but it was TAMAOKI who prevailed on shido penalties with two against her name and three against UDAKA. 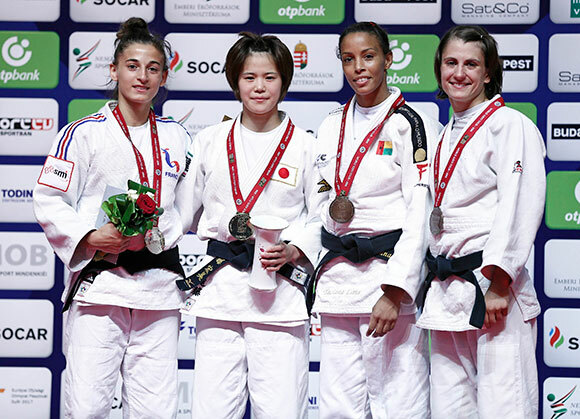 The first bronze medal was convincingly won by five-time world medallist Telma MONTEIRO (POR) who scored three times against Warsaw European Open silver medallist Sappho COBAN (GER). On her return from a knee injury, Portugal’s top judoka marked her first competition of 2016 with a place on the podium which came after a waza-ari and a yuko score gave the four-time world runner-up the platform to engage her opponent on the ground and COBAN had to submit to a lightning quick juji-gatame. The second bronze medal was won by Olympic bronze medallist Marti MALLOY (USA) who saw off Zagreb Grand Prix bronze medallist Johanna MUELLER (GER) after the latter received a shido in the scoreless contest while American ace and Rio-bound MALLOY pitched an unblemished record. Junior world champion NABEKURA Nami (JPN) starred for a youthful Japanese team as world and European champion Tina TRSTENJAK (SLO) was cast aside in the -63kg final. NABEKURA, from Himeji, Hyogo, Japan, was not fazed by the red backpatch status of world champion TRSTENJAK as she caught the Slovenian with an osoto-gari for a yuko score and looked like she belonged on the world stage. NABEKURA, 19, won her maiden Grand Prix after two shido penalties for passivity and a shido against TRSTENJAK for a gripping infringement were deemed insignificant due to the only score of the four minute contest going in the favour of the Japanese. In the first bronze medal contest Oceania Championships winner Katharina HAECKER (AUS) defeated Junior World Championships bronze medallist Lucy RENSHALL (GBR) with a koshi-jime strangle to the delight of her ecstatic coach. 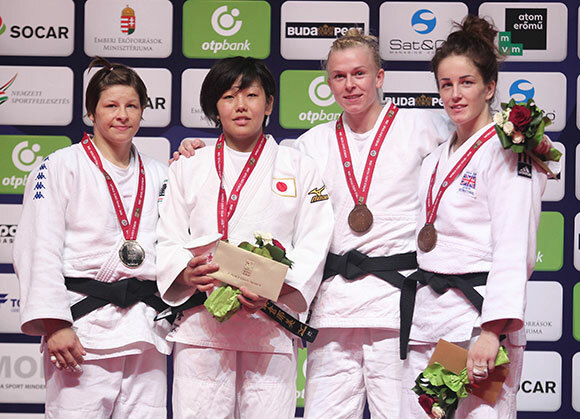 The second bronze medal contest featured former Lisbon European Open silver medallist Amy LIVESEY (GBR) and Pan American Championships bronze medallist Estefania GARCIA (ECU) and it was 22-year-old LIVESEY from SKK Judo Club in St Helens, England, who earned her first Grand Prix honours. The British fighter produced two yuko scores without reply for a brilliant result on her Grand Prix debut. 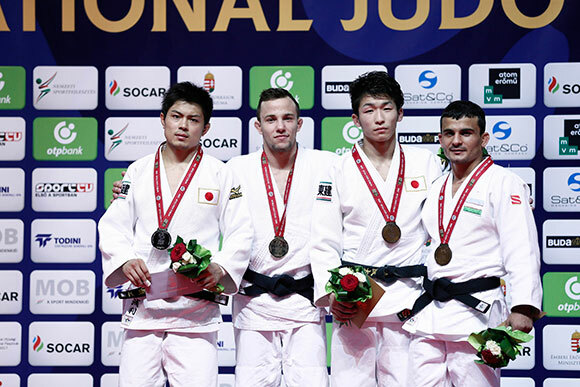 World number 278 AOKI Dai (JPN) won the first IJF gold medal of his career and the first men’s final at the Budapest Grand Prix 2016 as he beat Tashkent Grand Prix bronze medallist Otar BESTAEV (KGZ). AOKI was fifth at the Tokyo Grand Slam last year and returned to the IJF circuit in Budapest with medal ambitions which were realised in only his third appearance on the IJF World Judo Tour. AOKI trapped the vastly-experienced BESTAEV on the tatami and held his opponent there in osaekomi for 20 seconds and ippon. The victory meant that Japan made a perfect start to the competition by winning the first male and female finals in Budapest as they typically set a rampant pace on the world stage. 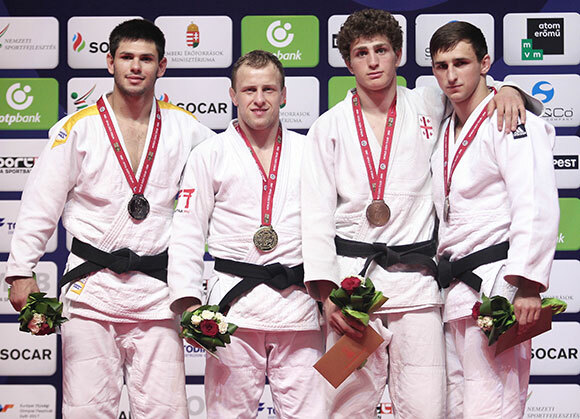 The first bronze medal fight was won by 21-year-old Prague European Open silver medallist Cedric REVOL (FRA) as he defeated Junior world bronze medallist Irakli KUPATADZE (GEO). 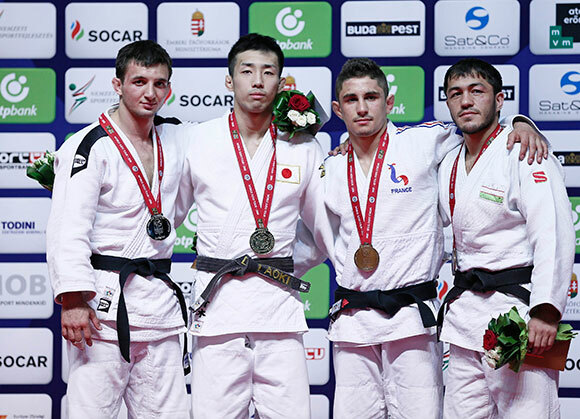 REVOL won his first Grand Prix medal at his first attempt by a waza-ari score and both judoka could become fixtures in this category in the next Olympic cycle towards Tokyo 2020. The second bronze medal fight of the men’s -60kg category saw Almaty Grand Prix bronze medallist and top seed Sharafuddin LUTFILLAEV (UZB) defeat Ilgar MUSHKIYEV (AZE). LUTFILLAEV made the better start and MUSHKIYEV was overzealous when he attacked as he was disqualified for a leg grab to gift the bronze medal to the Uzbek star who needs to assistance from his opponents. Tunisia African Open bronze medallist Adrian GOMBOC (SLO) won his first Grand Prix gold medal as Slovenia made a sensational start to the competition. Former Zagreb Grand Prix bronze medallist GOMBOC squared off against Junior world champion ASARI Masaya (JPN) and the 20-year-old, who was making his senior international debut in Budapest, limped his way onto the tatami and was unable to replicate his earlier form from the preliminaries as he lost by two yuko scores. In the first bronze medal contest Casablanca African Open silver medallist Alexandre MARIAC (FRA) gave his all against Jeju Grand Prix silver medallist FUJISAKA Taroh (JPN) but the Frenchman lost out on shido penalties in a scoreless contest. MARIAC was penalised three times while FUJISAKA was only penalised once and therefore could add one more medal to Japan’s growing haul. The second bronze medal went to double Olympic bronze medallist Rishod SOBIROV (UZB) who beat former Tbilisi Grand Prix silver medallist Baruch SHMAILOV (ISR). The contest was scoreless with 44 seconds remaining and both judoka had each been penalised three times but SOBIROV always has an extra gear and sent his Israeli opponent to the tatami with a ko-uchi-gari for a waza-ari and held down his opponent with a tate-shiho-gatame for 15 seconds and bronze. Former European champion Rok DRAKSIC (SLO) is back to his best judo after following up on his European bronze medal by winning the Budapest Grand Prix. DRAKSIC has had to dig deep to end a mixed run of results by flying back into form in 2016 and former Cluj Napoca European Open silver medallist Dmytro KANIVETS (UKR) was conquered in the -73kg final as the Slovenian pinned the Ukrainian down on the tatami for 20 seconds and ippon. DRAKSIC looked confident and moved well as he secured control of his opponent and ended up in a tate-shiho-gatame hold. KANIVETS will still be delighted with his effort as he won his first IJF World Judo Tour medal and will hope to repeat that achievement on many occasions post-Rio. The first bronze medal was won by 20-year-old Giorgi KATSIASHVILI (GEO) who celebrated his first Grand Prix medal by defeating three-time Grand Slam medallist Igor WANDTKE (GER) by ippon with a traditionally Georgian style pick-up. The second and last male bronze medal fight of the first day of competition in Hungary saw Artem KHOMULA (UKR) deny Gambia what would have been a first Grand Prix medal in their history as Faye NJIE (GAM) fell by ippon in the highest profile contest of his career.